Hello and welcome to our reefs. 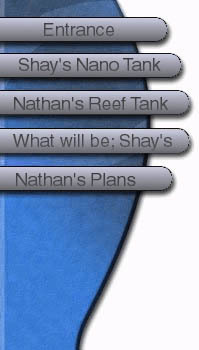 Nathan controls a 46 Bowfront filled with strange and exotic ocean animals ranging from sea pens to acroporids. Shay on the other hand WILL have a beautiful nano tank filled with only the prettiest fish and healthiest corals. See the button over there? Guess what happens when you click on one? This hobby was choosen as something we could both do together about 4 years ago. Since then we have spent way to much money, and tried way to many crazy ideas. But I have kept many a beautiful coral and fish in my tanks, and tried to care for them in a good mannor.